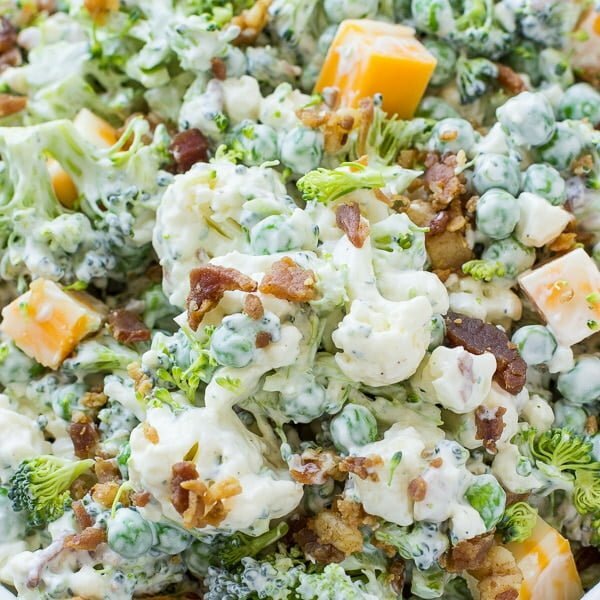 This Bacon Ranch Broccoli Salad will be your new summer go-to salad each and every time. Can we be honest with each other for a moment? While I love the thought of being healthy and eating salads each and every day, it’s just not logical for me and my taste buds. I know the importance of getting the vegetables into my mouth and body for good health reasons, but after a while, I just CRAVE more flavor and options. 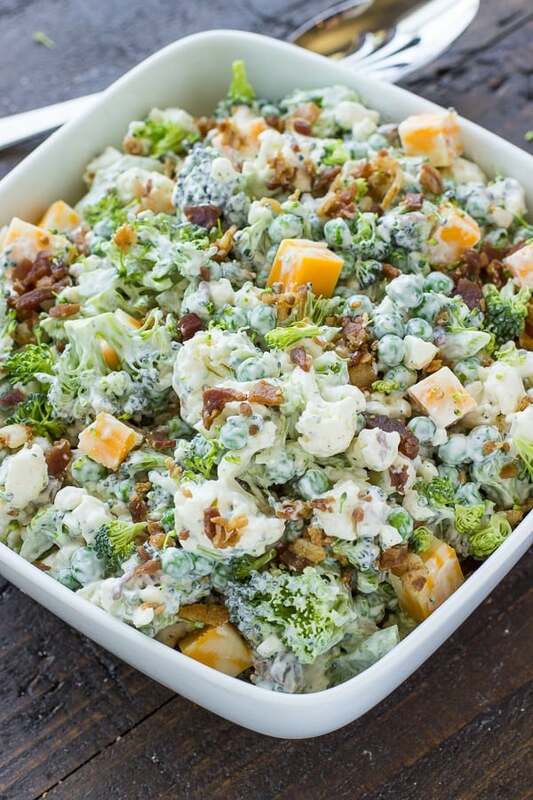 And this is why, without a doubt, I’m super-stoked to share this amazing Bacon Ranch Broccoli Salad recipe with you. 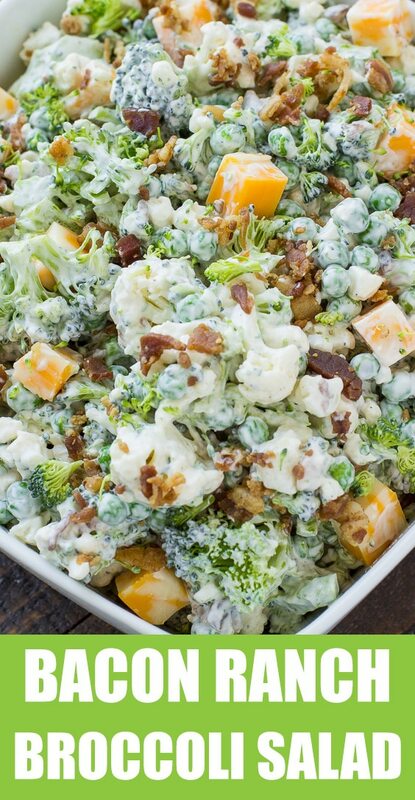 While it’s not your traditional salad, it’s still packed full of healthy and delicious veggies like broccoli, cauliflower, onions, and peas and…(drumroll, please!)…Bacon! When I say that this recipe is easy, it truly is. Like insanely simple easy. 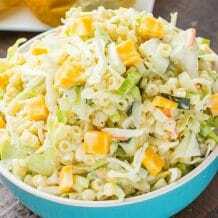 No cooking at all easy…just cut up veggies, mix in the dressing and let those flavors melt together perfectly easy. 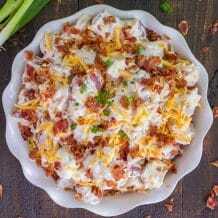 Not only can this Bacon Ranch Broccoli Salad be enjoyed and eaten right away, I’ve found that once you have it prepared, it’s one of those recipes that seem to taste better the very next day once it’s had time to chill and rest. 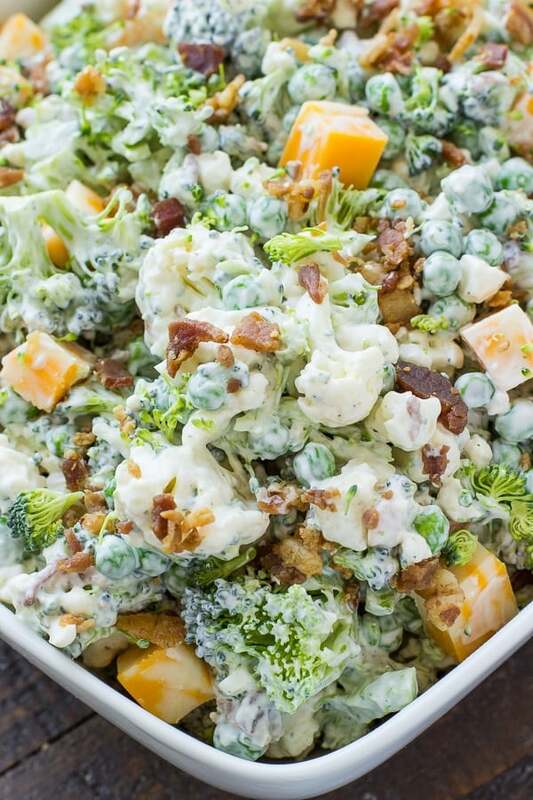 If you are looking for a way to take your simple salads to a whole other level, this Bacon Ranch Broccoli Salad recipe is exactly what you need! ● CAULIFLOWER: 1 head of cauliflower or some grocery stores have the cauliflower already chopped for you. ● BROCCOLI: 1 bunch of broccoli. ● GREEN ONIONS: 1 bunch of green onions. ● FROZEN PEAS: 1 (10 oz.) bag of frozen peas. ● SOUR CREAM: 1 cup of sour cream. ● MAYO: 1 cup of mayo. ● HIDDEN VALLEY RANCH: 1 packet of hidden valley ranch dressing mix. ● COLBY JACK CHEESE STICKS: 1 packet of Colby Jack cheese sticks. STEP 1: Cut up cauliflower and broccoli into small pieces. STEP 2: In a large bowl, add cauliflower, broccoli, diced green onions, bacon, frozen peas and cubed colby jack cheese. STEP 3: In a medium sized bowl, mix sour cream, mayo and ranch packet together. Pour dressing over salad and mix well. EASY BACON TIP: I don’t know about you but I’m not a big fan of making bacon. So, to make things easy I love these Oscar Meyer Real Bacon Recipe Pieces. I used 2 (2.8 oz.) packages for this recipe. CHEESE STICKS: Again, to make things easy. I used these Sargento Colby Jack Cheese Sticks and cut each stick into pieces to make small cubes. 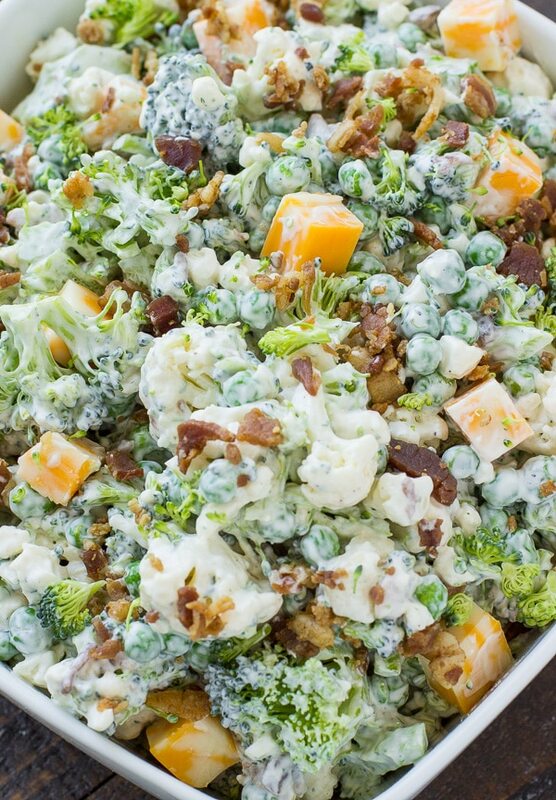 MAKE-AHEAD: This broccoli salad can be made the day before. 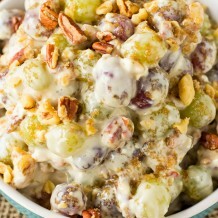 I just add the cheese and bacon right before I’m ready to serve it, just so the bacon and cheese don’t get soggy/soft. SHARP KNIFE: It’s so important to have at least one really good knife. It makes chopping and cutting things so much faster! CUTTING BOARD: This is my all-time favorite cutting board! LARGE MIXING BOWL: This is the BEST large mixing bowl for mixing salads, casseroles..anything really. SERVING BOWL: Here is the white serving bowl I used to serve this broccoli salad. 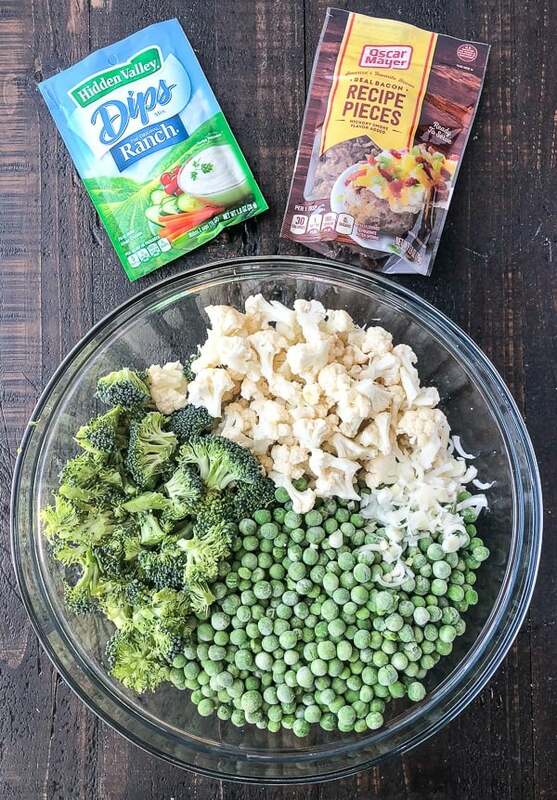 Cut up cauliflower and broccoli into small pieces. 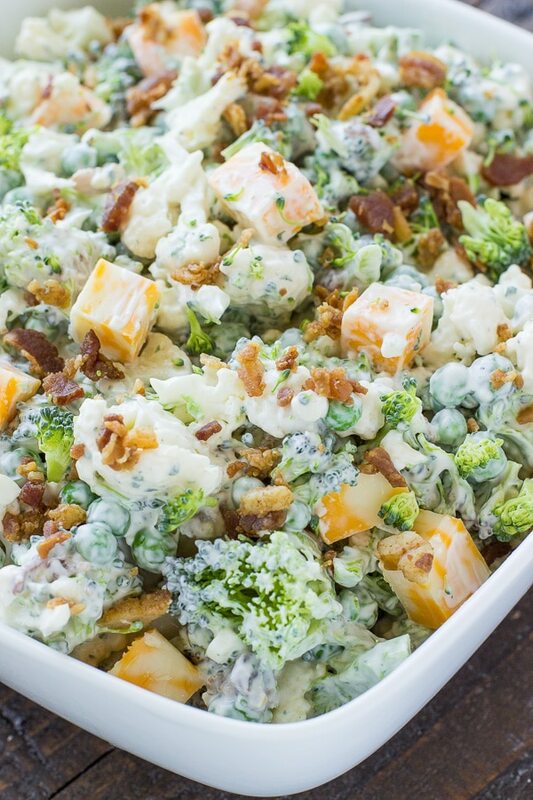 In a large bowl, add cauliflower, broccoli, diced green onions, bacon, frozen peas and cubed colby jack cheese. In a medium sized bowl, mix sour cream, mayo and ranch packet together. Pour dressing over salad and mix well. This was delicious! I made exactly as written for a potluck the following day. I saved the cheese and bacon for the last minute as suggested. In the future I won’t make it ahead and I will leave off the bacon and cheese. Thanks for a great recipe.